North Korea is marking the 101st anniversary of the birth of its founding father, Kim Il-sung, amid continuing tensions over its nuclear ambitions. 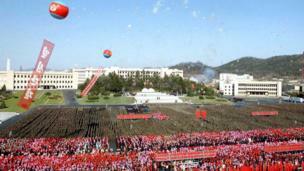 North Korea is marking the 101st anniversary of the birth of its founding father, Kim Il-sung. This photograph, distributed by North Korea's official Korean Central News Agency (KCNA), shows people gathering below bronze statues of Kim Il-sung and his son, the late leader Kim Jong-il, at Mansudae in Pyongyang. The ceremonies come amid continuing tensions over the country's nuclear programme. 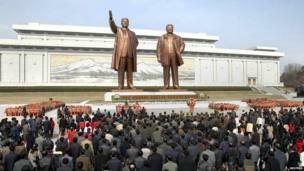 There has been speculation that the North will use Kim Il-sung's birthday for a missile launch. 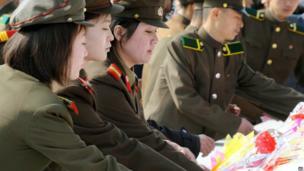 Soldiers are seen offering flowers for Kim Il-sung and Kim Jong-il. The anniversary of Kim Il-sung's birthday is an important holiday in North Korea. The UN estimates the country has a population of about 24.4million people. They live under the control of a secretive communist regime which tolerates no dissent. 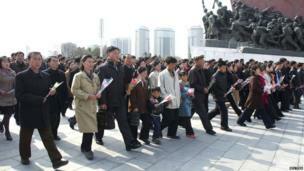 North Korean party officials visited Mankyongdae in Pyongyang, the birthplace Kim Il-sung. Current leader Kim Jong-un visited the mausoleum of his grandfather and his father Kim Jong-il in Pyongyang, the official KCNA news agency said. This picture taken by the KCNA shows a huge crowd celebrating the unveiling of bronze statues of Kim Il-sung and Kim Jong-il outside the Ministry of People's Security in Pyongyang. 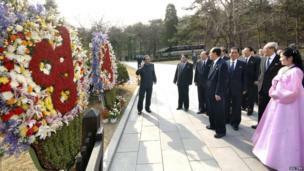 Officials attended a meeting in Pyongyang as part of the celebrations. 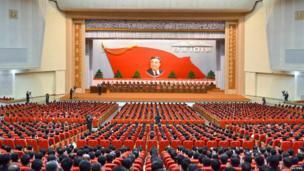 Kim Il-sung came to power after World War II and shaped North Korea's political affairs for almost half a century. He died in 1994, and was succeeded by Kim Jong-un's father Kim Jong-il, who died in 2011. In recent weeks, North Korea has threatened to attack South Korea, Japan and US bases in the region. Protesters in the South Korean capital Seoul held a rally to demonstrate against the North's tactics on the same day that their neighbours were marking the birthday of Kim Il-sung. 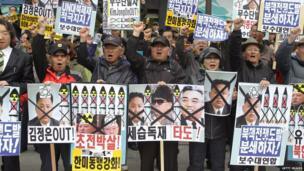 Anti-North Korea protesters burned effigies during a protest in central Seoul in South Korea.